After their very positive feedback on the Prometheus sandstorm FX work, The VFX Show podcast surprises me again with some smashingly positive praise for the helicopter attack/crash scene in the latest James Bond film, Skyfall (min 49:30 of the podcast). Thanks to Mike Seymour and co-hosts for their kind words, and congratulations to everyone involved in making those shots look brilliant. - Atmospheric effects (blown dust and grass/debris particles) from interaction with CG helicopter throughout that sequence. - Laying out the crash shot, and RnD to define and test best approaches and strategies for Kali destruction in crash shots. FX TD James Rustad briefly joined in to do the excellent kali destruction work on the shot itself. 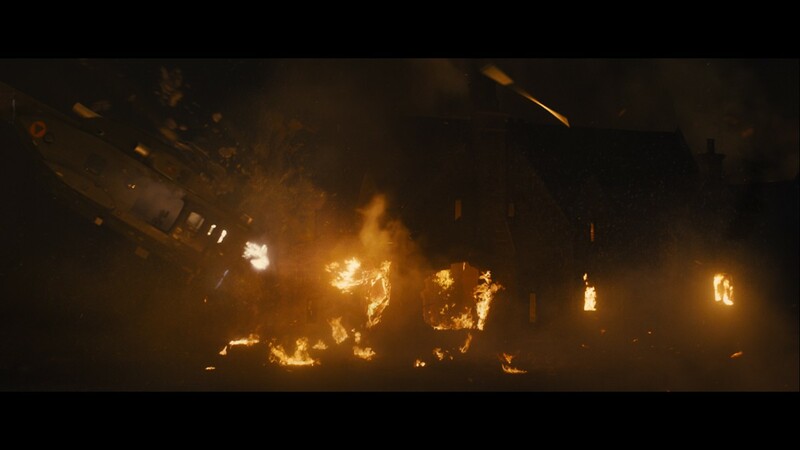 - Some additional FX for that destruction shot. - Bubbles for one underwater shot, beneath the frozen lake. You can find the full shortlist, and details about each film's VFX, at this post on fxguide. Binary Flare: will be my professional blog, to talk somewhat exclusively about my projects, and about VFX and Film-making in general. Strange High House in the Mist: will pop back up in some other strange misty corner of the interstreams, and will be my personal blog full of random blurbs about everything and anything. Probably will discuss some music, philosophy, art... not sure yet what it will be, so we will make that discovery together, if you care to follow me there. I am not yet sure about what will happen with older posts in this blog. Many old ones would find a better home in the Strange High House, but I am not sure of how much trouble the move would be. Let your thoughts be read in the comments below. Do you like the new name? What do you think should be done with older random posts? Should they be kept here even if a copy is placed in the new Strange High House? Should they be completely moved? Any other ideas? Dr. Ian Malcolm: Yeah, but your scientists were so preoccupied with whether they could that they didn't stop to think if they should. Most of you will recognize that quote from Jurassic Park, a movie which, when it came out in 1993, revolutionized the world of cinema visual effects, and in many ways defined what good, modern visual effects should be, not just in their technical quality and realism, but also in regards to serving and supporting a story. I saw the movie again a few months ago. I didn't know what to expect, carrying with me the memories of the first time that, in a cinema, it struck me with awe as a teenager, and watching it again this time through the eyes of a professional of cinema and visual effects. Not only was I surprised to see that some of its CG work still holds amazingly well, but also found a little pearl of an insight, loaded with irony, hidden within its theme, and clearly distilled in the above quote. What Dr.Malcolm states about the scientists of Isla Nublar, can very well be applied to the film-makers of our day. Breakthroughs in the art and science of visual effects, many of them brought forward (and here comes the irony) by a few amazing leaps forward of which Jurassic Park is a great exponent, have brought us to a point where anything is possible. Nowadays, anything can be made to appear on the cinema screen. Absolutely anything that anyone can ever think of, up to a level of realism limited only by budget, time and artistic talent. Don't get me wrong: it is very far from trivial, in most cases. But it is possible. Sadly, this also means that many of the film-makers of our time, like the very bright minds that Hammond gathered for his jurassic venture, because they can, forget to stop and ponder if they should. Can you remember an instance where you were suddenly distracted from a film's story by some gimmicky VFX shot? Impossible 360 camera moves or kilometer-long zooming camera travelings? moving through solid objects or people? I am sure you've experience this more than a few times. Feel free to add your comments below, or likewise let me know about instances of well-used obvious VFX shots that still served and reinforced the narrative and its theme. Edit: In episode 7 of the "Spot Cast" podcast (min. 27), in an interview with Stu Maschwitz, he discusses an interesting example of an occasion where, working on "The Spirit", he saved Frank Miller from making the mistake of doing such an impossible flying camera shot through the streets of Central City. There is a new Prometheus featurette, with a few more glimpses at the sandstorm I made (0:35). To quote Charlize Theron, talking about Ridley Scott "he's my fantasy director", and to work in this project was a fantasy come true.